You may have found us on booking.com, agoda, even Trip Advisor, however when it comes to booking your stay, there’s no better place to do it than through our very own reservations department. Booking Direct with us ensures you receive a whole host of benefits you would not get elsewhere. Need to alter your booking? No problem! When you book direct with us we are just a phone call away. Bookings made on 3rd party sites cannot be altered by us, that means you have to try to contact them to change anything. We charge you just a 1 Night deposit on your reservation when you book with us for normal price and 50% for promo one. You don't need to search around our site for special offers. Our booking engine has been designed with you in mind. If there is a special offer available for the dates and nights you are looking for it will be displayed for you when you check availability. We make booking directly with us worth your while with extra perks and the best rate guaranteed. We always display our very best prices on our website. So if you book your stay directly with us, you’re guaranteed to get the best price for your stay. If you happen to find a better rate elsewhere – let us know, and we’ll match it. we love to treat our guests like Family, when you book directly with us, we’ll upgrade your booking to the next room category (subject to availability). We know that feeling at home can be as simple as being able to make yourself a cup of tea or coffee. That’s why we’ll treat you to complimentary tea and coffee making facilities in your villa. Stay connected and avoid roaming charges wherever you are in your villa, with our free unlimited and high-speed Wi-Fi throughout your stay. Reserving on our site is quick and easy and there are no hidden fees. 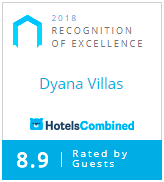 If you make a room reservation through our website or direct with DYANA VILLAS , we guarantee that you will receive the lowest rate possible. please go to contact menu on our website and let us know about that issue. The Best Rate Guarantee does not apply to any rates from opaque providers. An opaque provider is any provider that prevents the buyer from identifying the hotel until after the buyer has made a reservation and guaranteed payment. A site is opaque if it does not divulge the name of the villa, the precise location of the villa, or other specific information which could enable identification of the villa i.e. villas picture and villa name.